This page provides access to a variety of maps, applications, and databases produced at CRITFC on behalf of our member tribes. The Salmon and Steelhead Population Crosswalk includes two online mapping tools and a fish names query system, which provides access to geographic and descriptive information on fish populations (pop/units) of salmon and steelhead as defined by state and federal agencies, tribes, and regional projects in the Columbia Basin. If your browser is having problems loading the online mapper, try a different browser. If you report the issue – we will work to find the fix. The Limiting Factors Application displays the four main factors limiting salmon distribution and abundance from the Subbasin Plans that came out of the NW Power and Conservation Council process during the early 2000s. If your browser is having problems loading the online mapper, try a different browser. If you report the issue – we will work to find the fix. The PCSRF Projects Application distinguishes tribal Pacific Coastal Salmon Recovery Fund projects by their type and location, and provides detailed reports for these projects. Please view the metadata document for more information. If your browser is having problems loading the online mapper, try a different browser. If you report the issue – we will work to find the fix. 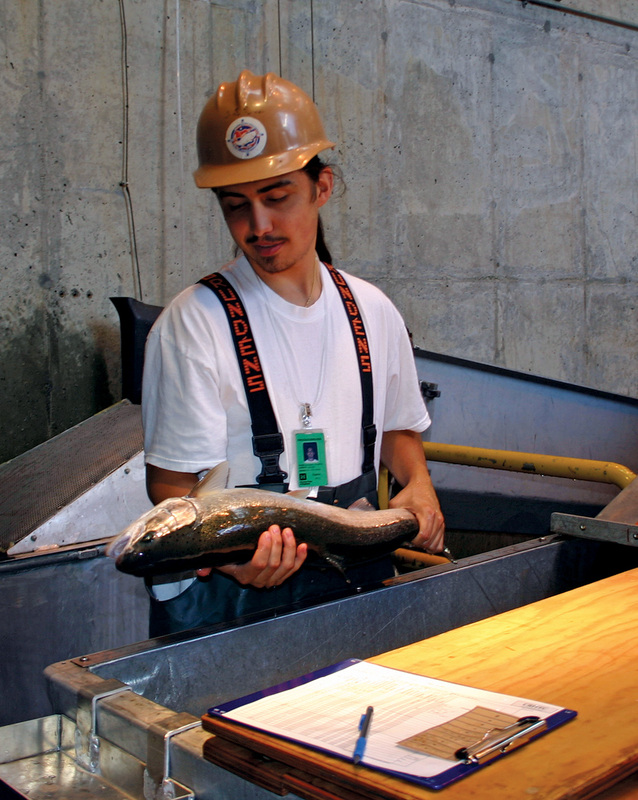 A weekly summary of fish passage age statistics as sampled at Bonneville Dam by CRITFC staff. Note: These reports represent work in progress. The sampling data will likely be revised throughout the season as they are reviewed. Pump intake temperature measurements from old Hanford Town site boat launch. GIS layers and databases produced through research, monitoring, and evaluation projects conducted by CRITFC staff. Download files and metadata links provided for individual data sets. Periodically, current data sets are updated and new data sets are published. Joe Nowinski for information on login credentials. Future applications, maps, and data will continue to be developed on this site so check back soon! CRITFC intern Solomon Trimble assessing indicator stocks within the Columbia River Basin. CRITFC has developed a comprehensive research strategy to monitor the age and stock composition of adult Pacific salmon returning to the Columbia River and has monitored the above-Bonneville Dam adult migration of salmon species since 1985.